Get Voice, Video, Mobility, Chat, Security, Presence, Unified Communications, and more in a single-source PBX System solution. training and support as well as be there for you when you are ready to upgrade, expand, and/or relocate. 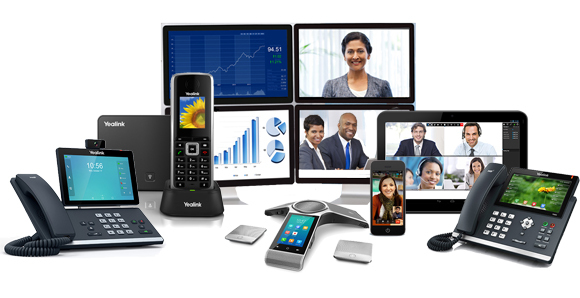 Our award-winning small, medium and large office phone systems support 4 lines to thousands and include features such as Voicemail-to-Email, Auto Attendant, smartphone apps, video teleconferencing, web collaboration, chat, presence, contact center/call center, call recording, security, VoIP, and so much more. *Unlimited Nationwide calling is included with our ACCloud cloud based phone system. Add VoIP phone service (SIP Trunks) and virtual faxing to your business telephone system for a complete telecommunications package solution. ACC Telecom has been a telecommunications company and PBX equipment provider in Rockville, Maryland for over three decades. We can also help you cabling, IP surveillance camera systems, loudspeaker paging, and so much more. Contact us today to schedule your free consultation with one of our certified telecom experts. Contact us today to schedule your free telecommunications consultation.